The Social Pug Profile is back and this time round it is a regular on The Pug Diary’s training posts, Ernest. Ernest is an adorable boy who takes the time out of his busy pug schedule to show how to be an awesome, well trained pug for all of you. And since you already now that he is super at high five-ing, shaking and of course, leaving a cheeseburger alone, now it is time for you to get to know this awesome little bundle of fun some more. So here is Ernest’s interview for you to enjoy. Age: I am almost 8 months old – (yes I’m a little bigger for my age). Favourite time of day? Aside from food time (obviously), my favourite time would have to be weekend breakfasts with my humans. We always try go somewhere different and have a great walk afterwards. At the same time, when my humans come home from work would have to be right up there – it means it’s food time AND snuggle time! Do you have a toy you can’t live without? I certainly can’t sleep without my Nelly the Elephant. It has to be with me at bedtime. When awake, I love chasing my cars around the house or playing with dad’s football. What do you hate the most? Empty food bowls obviously, I also do not like late night helicopters – who do they think they are flying around at night when it’s sleep time?!?! My humans are working on this with me though using the Sound Proof Puppy Training App. What do you love the most? This goes paw in paw – beach and water. Any water where I can get wet – showers, fountains etc. I love to make the surfers wait their turn while I’m busy drenching myself. Do you have any bad habits? I don’t call them bad habits, I call them quirky characteristics. For example, I know when my humans want to go to bed. They stand up and turn the first light off, and from here I know it’s the perfect time to play hide and seek and run away! What do you think is your best quality? I’m a “people dog”. I love to be around other humans and animals, and always show off my tricks by shaking hands to say hello. What does a typical day look like for you? During the week I get up early with my humans, have an early breakfast and play before they go to work. From here this is my rest time so I’m fresh when they get home from work. In the afternoons my daddy human takes me for walks and play. On weekends, as previously mentioned, I take my humans with me to the beach and have a swim and play. I am a lucky pug in that both my humans are teachers, so there are weeks at a time when they are home all day long and it’s non-stop attention for me. 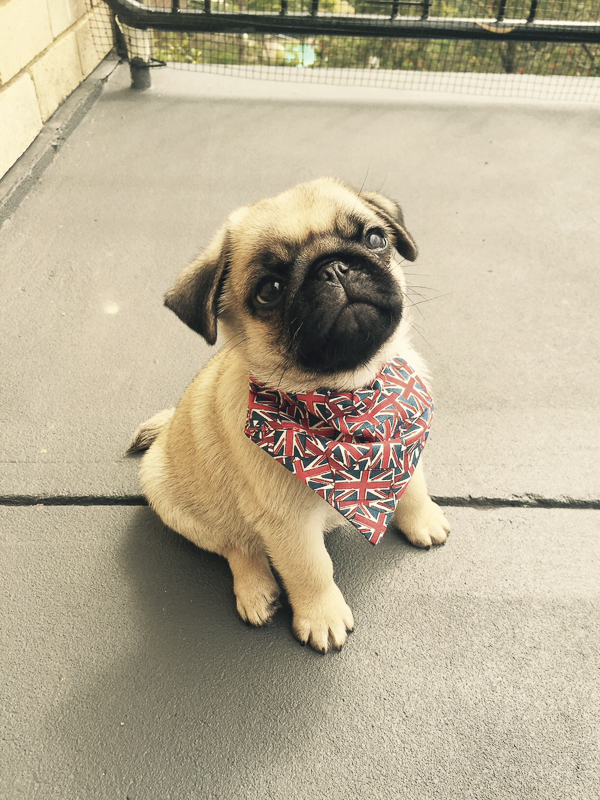 You feature quite regularly in the Pug Training 101 videos with Amy on The Pug Diary. What has been your favourite command to learn so far? I have been lucky enough to have the best puppy trainer in the world. We get along so well and she has taught me so much. I think my favourite command would have to be the high-five/high-ten. It took me a while to catch on initially, as I was being a stubborn pug that day, but I can now do a high five with either front paw, and a high-ten for those that ask! 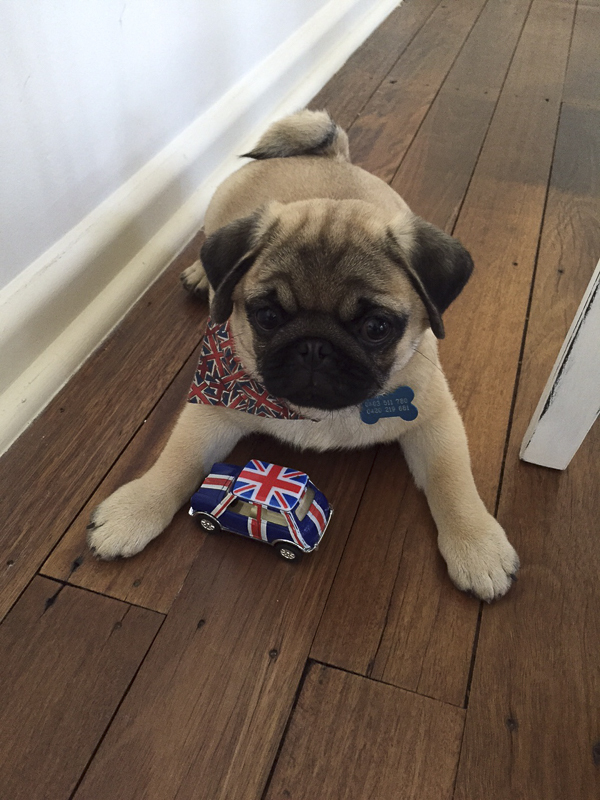 What tips would you give to other pugs training? To listen carefully to their instructions, because if you do, you get rewarded with yummy treats and lots of praise and attention, and who doesn’t like that??? Where can we follow your adventures? 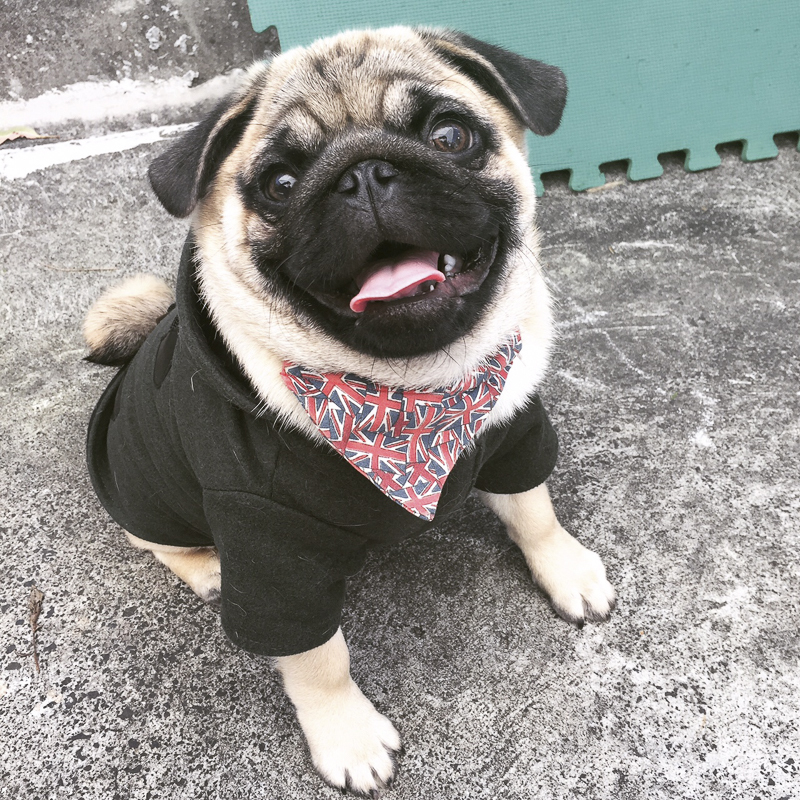 I can be found and contacted on Instagram – @ernest_pug I love meeting new people online, so please come and follow me and my adventures!! Be sure to leave a pug love note for Ernest in the comments. I am pawsitive he will love to read them. Kristy is the founder and editor of The Pug Diary, a photographer and pug mum extraordinaire to Ref + Serina. Kristy has combined her passion for photography with the love of pugs to bring you all of her knowledge of pugs and more to you through The Pug Diary. Is Ernest a Kabova Pug? The Pug Diary is the essential guide for pug parents who want their pugs to have long, happy, healthy lives. At The Pug Diary, we only work with brands, photographers + experts that we know, love + trust, ensuring we bring you the best information to have a healthy + happy pug. 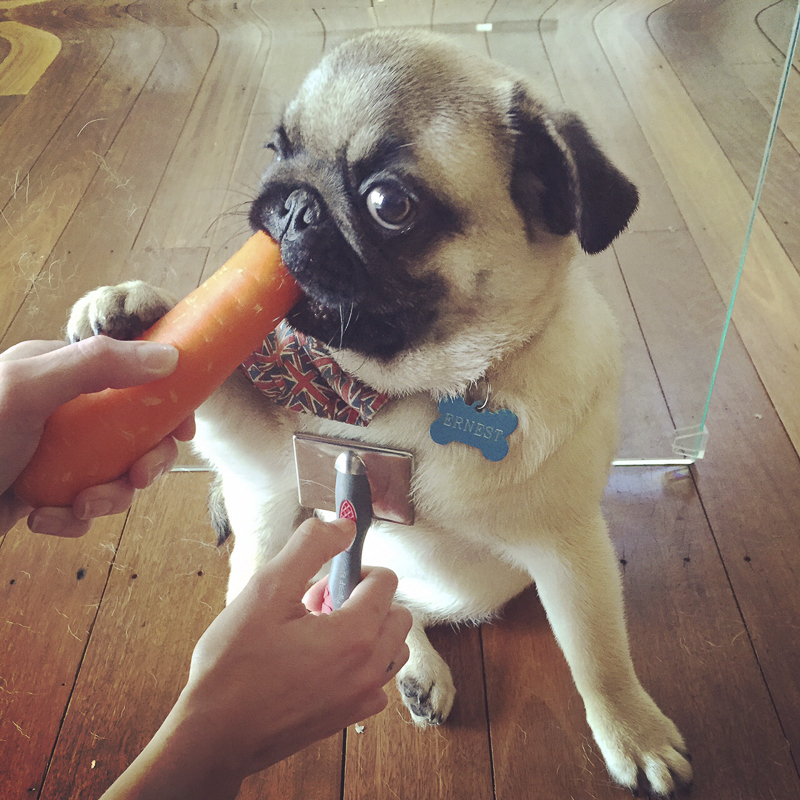 Join our #healthyhappypugs movement with tips to help keep your pug healthy + happy. 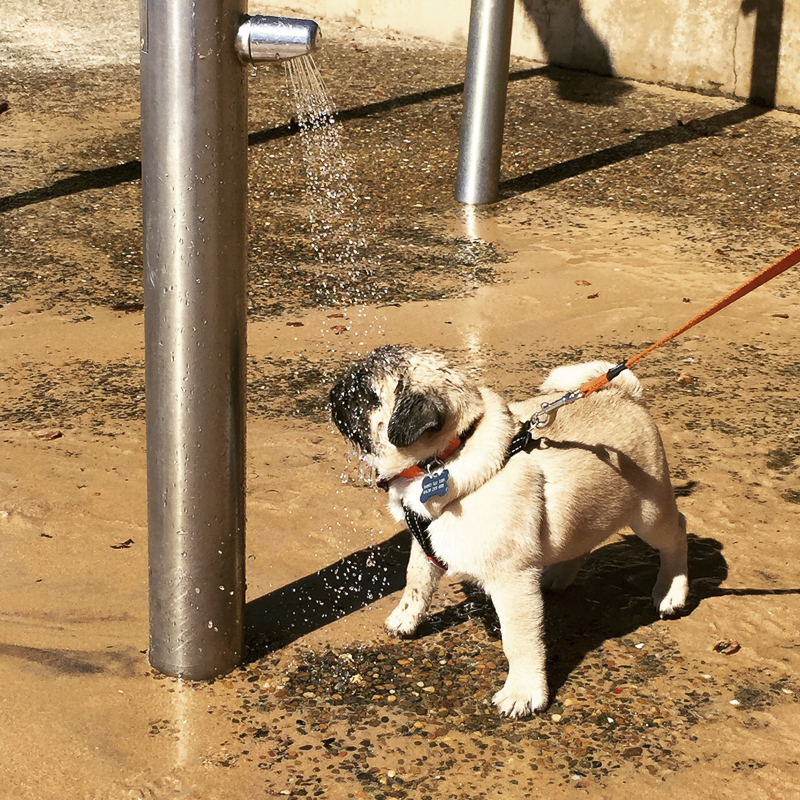 © 2014-2018 The Pug Diary . All rights reserved . All images and content are copyright The Pug Diary unless stated otherwise . 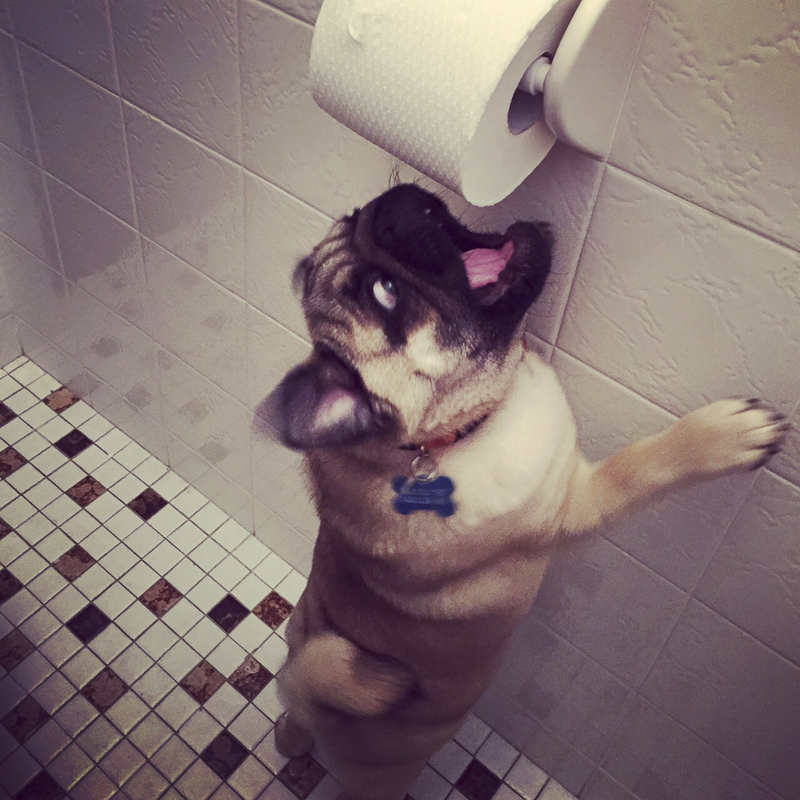 Never miss a thing from The Pug Diary again. Get your weekly dose of pug direct to your inbox.